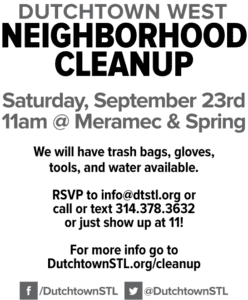 Join your neighbors in Dutchtown West on Saturday morning for a neighborhood cleanup! Neighbors will meet at the corner of Spring and Meramec at 11am to spread out and pick up litter for about an hour. There will be gloves, litter grabbers, trash bags, and water available for the participants. If you’re sure you can make it, please consider RSVP-ing by marking yourself as “going” on the Facebook event page, emailing info@dtstl.org, or sending a message using our contact form. But if you want to just show up that’s okay too. DutchtownSTL.org would like to help you organize your own neighborhood cleanup too! Visit our cleanup page for a list of upcoming cleanups and to find out how to organize your own. We can help with making flyers and getting the word out. If you have any questions, let us know! This post was updated on September 20, 2017 . Read more news about Cleanups, Dutchtown West, and Volunteer Opportunities.